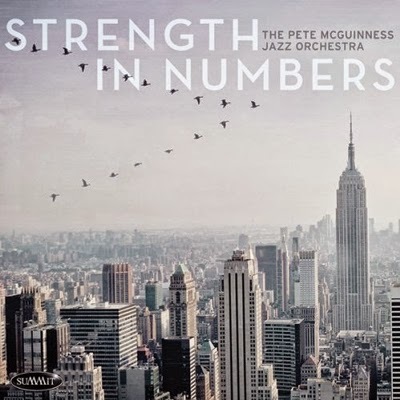 This unit is led by trombonist, composer and arranger Pete McGuinness, a staple in the New York City jazz scene. He’s another of this brave new jazz world’s well-educated musicians, with stints in the Hall High School Jazz program, in West Hartford, Ct.; college studies at the New England Conservatory of Music; then the University of Miami, for a bachelor’s degree; and finally the Manhattan School of Music, for a master’s degree. McGuinness has performed with name bands led by Maria Schneider, Lionel Hampton, Jimmy Heath and Woody Herman, and has served “in the pit” for numerous Broadway shows. He’s a prolific writer and arranger, having composed for many jazz artists and schools, as well as his own unit, featured in this release. Oh, yes; he’s also a teacher. The only big bands operating these days are created by jazz artists who miss them as much as I do. McGuinness is one of those. And, as often is the case, there’s no shortage of musicians who feel the same way, so the catalytic leader never has trouble finding stellar artists to join the group. It’s often just to get together on their own time, to relax and enjoy. Once in awhile, though, the results are so great that others — musicians, teachers, producers, etc. — offer to fund the recording and distribution of a CD, to share with other like-minded folks. This release is the result of just such an effort. The contributors are too numerous to cite, but are included in the liner notes. McGuinness’ jazz orchestra more that meets the necessary criteria. It swings wonderfully, the artists are superb, the section work and solos are terrific, and the arrangements are real movers. Don’t miss this sensational piece of work.